MAJOR sections of highway, including the Toowoomba Range, will be forced to close to transport enormous wind turbine blades for the Coopers Gap Wind Farm. 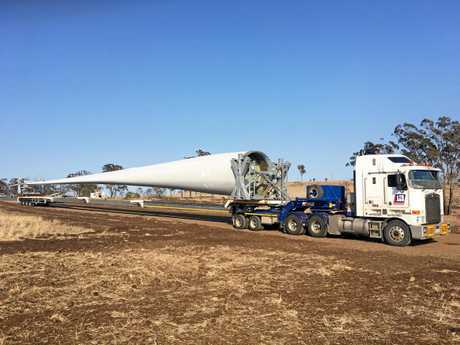 AGL project manager Tim Knill said the largest blades heading along the Warrego Highway were 67.2m long and weigh 22 tonnes - the largest ever transported in Australia. "Several shipments of wind farm components, including the blades, have arrived at the Port of Brisbane and are in storage awaiting transportation," Mr Knill said. "The movement of such large pieces of equipment requires detailed planning and we are predicting approximately 1,200 oversize movements, involving blades, hubs, tower sections and nacelles." Overnight transportation of the blades will continue throughout the remainder of the year following a trial delivery last week. "We aim to minimise the impacts on commuters so many of the movements are done at night time," Mr Knill said. "However, at times we will need to have major sections of highways, including the Toowoomba Range, closed to align with our commitment to safety. Delays can be expected and we ask for patience at these times. "The long blades ensure more energy is captured by every wind turbine. This brings down the cost of generation, but creates a high level of complexity in managing the transportation." The wind farm, situated between Dalby and Kingaroy, will be the largest in Australia when construction wraps up in 2019. For more information about the delivery routes and times, visit tmr.qld.gov.au.